Year 1 & 2 were a slightly different approach, I was drawing the ornate flourishes and details a lot in my personal work and that seemed a really good ‘fit’ for the Globes brand and we opted for the ’stop frame’ animation style which from a technical point of view is a more straightforward approach to production. However, this year felt like it was time to push things on and we wanted to try something a little different. Back in 2010 (Pre-Instagram for me!) I was publishing type work to Flickr and I had began experimenting with a style of repeating lines around text, giving the lettering warped abstract 3Ds (see above). I revisited it a few times then, fast forward to about 18 months ago I was approached to work for a big brand (Sadly, I’m not allowed to say who or show the work) to design a mountain bike and after some research I decided to try and mix this lettering and lined 3D concept with the gradients found on mountains and hills on maps - You know, those big fold out paper things before Google maps took over everything. Anyway, They matched really well and you could blend the gradient lines seamlessly with the lettering and it seemed a perfect fit. The bike got designed and at the last minute the project took a completely unexpected different direction and the bike never saw the light of day. It happens. …But, I had developed this ‘thing’ now that didn’t really have a commercial home that I really enjoyed producing so I just keep revisiting it through personal works waiting for a project that would be a good fit. Social media can be a great ‘sketchbook diary’ for me at times where you have the freedom of publishing experiments, some that work, some that don’t, some you revisit, some you bury there and then. Anyway, after getting the call and working through December with the Globes team and coming up with a selection of directions we opted for this treatment for this years show as it had a really nice connection - gradient lines for the Globes. Production was a real challenge this time around, it was the first time I had ever combined animations with stop frame as we wanted the ‘bouncing’ warped perspective but also wanted to include the realtime movement of the sheen of gold leaf and glitter as they were applied to the lettering. I used a light box and A3 paper to draw each frame, before scanning and lining up every frame in Photoshop. It has meant that I did very little else for the last few weeks as the deadline got closer and closer. A selection of the individual drawn frames. I’ve never really been obsessed by kit and equipment in the way that lots seem to be. Sure, I get it and at times i’m even slightly in awe of people being able to discuss and debate the absolute tiniest detail of product ‘a’ over product ‘b’ but for me, equipment just needs to work as well as possible. If I have a concept or a project of some sort I just need to work out a way to make that concept happen, in the best possible way and then set about finding the best possible kit for the job that will assist that. Firstly from out the box the biggest relief is its so easy to get going, no long winded tech stuff to get my head round, no dictionary-like books to read, it comes in 3 parts with one butterfly type screw and with a couple of turns of that then thats it, Its set up. The cabinet has a matte black finish while bezels are reasonably thin at half an inch each so it doesn’t look cluttered and you get a really ‘full’ screen image. Plugging anything in was easy too, its riddled with USB and HDMI ports so plugging in my MacBook Pro was instant and I was ready to go. The screen itself is mounted onto a rail which makes it so versatile to get every ‘tilt’ possible you might want to angle the monitor to. The screen quality is pretty ridiculous, the colours are so dense and sharp - the screen itself is 3840 x 2160 Ultra-HD. The screen is vibration-free too: with a still image you will not detect a single flicker. This I found to be a really great feature. Its a product aimed at designers and film editors and I could instantly see why, you can get so close and its so, so big. I’m obsessed with small detail and you can get into every single nook and cranny of your work on this 32” size. It delivers really rich colours and whats particurlarly useful is you are able to set numerous colour palettes depending on the varied projects I’m usually working on. It also come with a neat little gadget called a ‘HotKey puck’ which allows you to switch between various modes and filters on a selection of customisable buttons to suit your own preference. So summing it up, The BenQ PD3200U is a great piece of kit due to its really impressive features and capabilities. If you are looking for a 4K display for your creativity, then this is an absolute solid performer worthy of your consideration. Relentless dreams, Hard work & Wi-Fi. Today i’ll be telling 2 stories. The first is how I got here - How did I end up doing this and why do I draw on things? Its a peculiar story that I wouldn’t believe unless it had happened to me. After unexpected redundancy of my perfect job I felt I was at a junction - leave behind a 20+ year design career and re-train or go it alone, not turn anything down, try new things and see what happens. That approach left me setting up a cycling brand, working in a high security prison and spending my spare time drawing on coffee cups. The second story is how once finally some of my dreams came true they nearly all fell to pieces. I found myself watching the worlds biggest film stars walk past my animations on the red carpet at the Golden Globes while I had no studio, no office and ‘home’ was living on a camp bed in my Sisters front room next to my 11 year old Son and how this has shaped me, my work and my outlook. 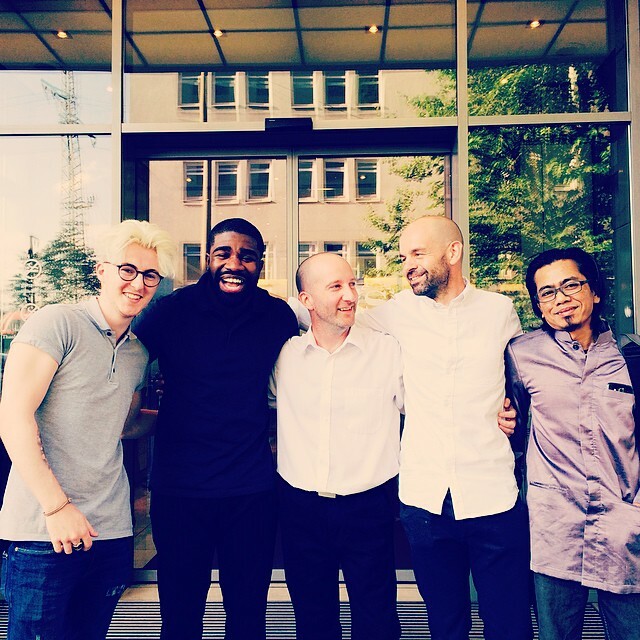 Hanbao was one of those projects that hit a real ‘sweet spot’ - a great brief and scope for creativity. I was called in initially earlier in the year to create a screen printed artwork that would be displayed through the restaurant (this also became the foundation for the ‘All Beef No Drama’ wall painting).. As the process continued Sebastian and Alexander, the brothers behind the brand came up with more requests to get further involved and the initial screen print turned into almost a ‘residency’ - spending more and more time moving from one artwork placement to the next - floors, walls, toilets etc etc. Including some additional process shots - The large ‘H’ started as a quick idea in my sketchbook that developed into a 6ft high concrete statue that took 5 men and an industrial ’skateboard’ to move into place. 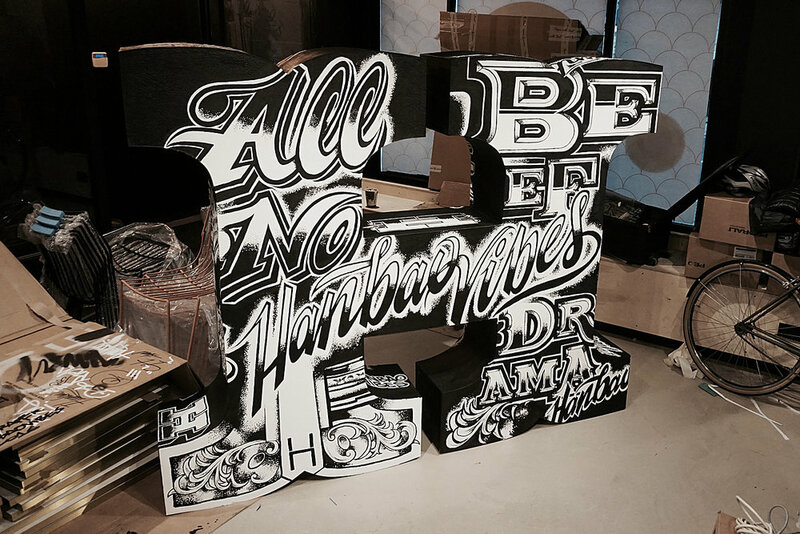 The ‘All Beef, No Drama’ prints were signed and limited to 150 each colour way and given out on launch night. 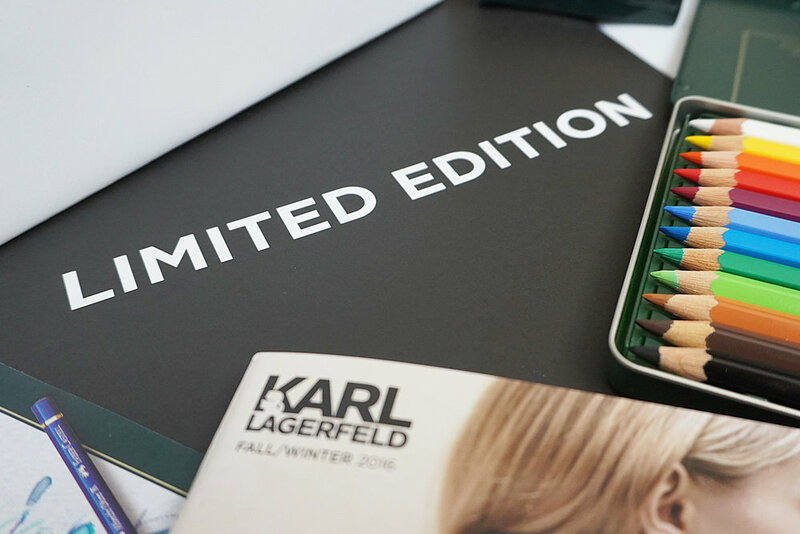 Karl Lagerfeld & Faber Castell - The Karlbox. The Karlbox was simultaneously released around the world to be sold exclusively at Karl Lagerfeld boutiques worldwide, Faber-Castell stores and Harrods London and it was great to be invited to the launch at Karl Lagerfelds Regent Street store in central London to first-hand see the level of detail and quality throughout the entire product which is outstanding. One of the things I really enjoy as part of my work and travels is meeting other creatives and finding what drives them and where they want to that drive to lead them and the launch was a really good opportunity to meet some new artists and creators and catch up with some old friends (more on that in a minute...). Wanted to say a big thank you to all the family at Faber Castell and Karl Lagerfeld for taking care of every part of my trip and letting me see such a unique, special product. Kelvins takes photo-realism with a pencil to the next level. (actually, the next-next level) and he’s been working for the last 12 months on a solo show called ‘interludes’ which is on from 14 September to 1 October at Albemarle Gallery on Albemarle Street in West London. I’ve seen some printed copies of the works which will feature in the show and can’t wait to see the real thing when the show opens. If you get the opportunity, go along as this will be an absolute essential visit…. June 1st. 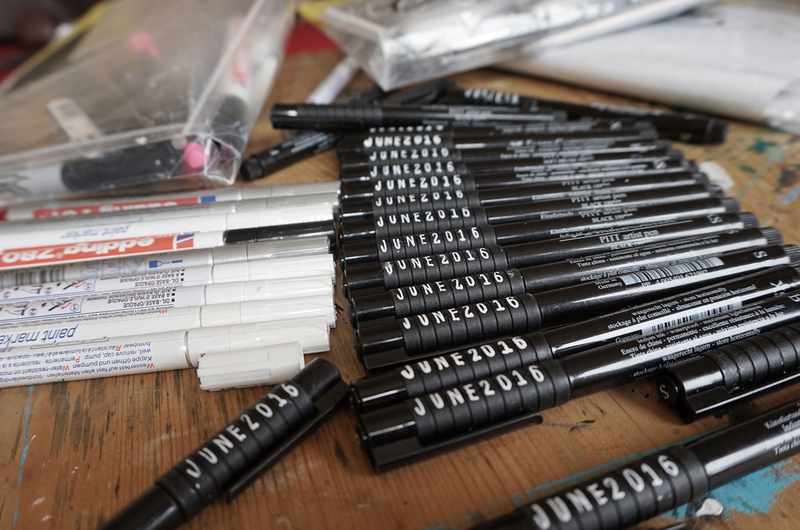 New month, New Pens. I've mentioned it before and get asked about it quite often but I get through a lot of pens. A real lot of pens. Over time the nibs grind down a little so they lose the 'sharpness' a little but still have lots of life (or ink) left in them so they can be relegated to filling in, or as trial pens for the drawing on food which is an absolute pen killer. It can get really confusing as I can have tens and tens of them around me so have taken to marking up the caps as a new batch comes into circulation rather than take hours taking and putting caps back on looking for a fresh nib! This week I had the pleasure of speaking at The Kiln. The Kiln is an enthusiastic, collaborative community supporting creative, craft and tech small businesses in Worcestershire and I had been asked to speak at the event based upon the theme ‘How to be Innovative’. The title of my talk was 'How panic, necessity and coffee found me in the Daily Mail’ and discussed a particular aspect of what I do, why I do it and where it all came from. 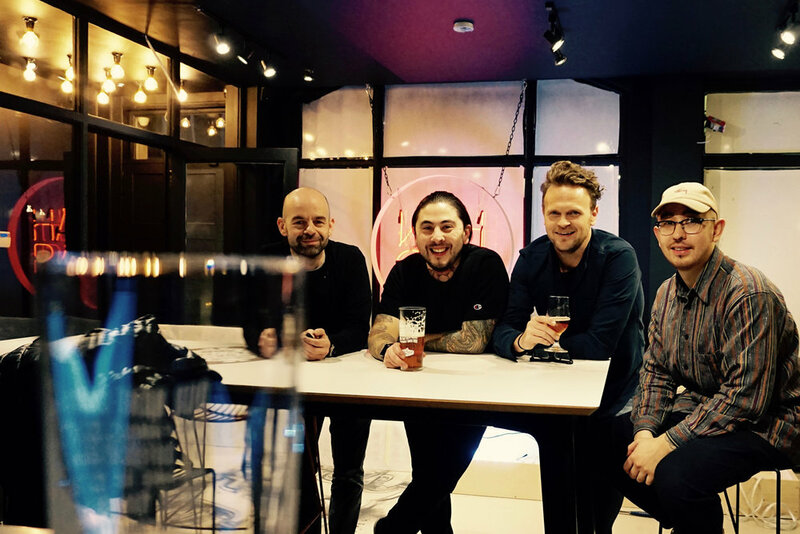 It was a great opportunity to meet part of the ever growing creative and tech community and to catch up with some old friends and I wish the guys at the Kiln the best of luck with securing a permanent co-working creative hub space. Really pleased to finally announce these. Its a range of double walled ceramic cups with silicon lids. These are now available across Europe and will be launched in the USA and rest of the world in January. This also seems a really good time to thank you all for your support. Seeing the cups grow from a quiet day doodling alone when I started freelancing and had no work on to this range being produced is amazing, and the project has largely been spurred on from the feedback I get. The support I've received has been incredible from every corner of the world, so sending you all a big thank you. Many more pictures of the range on the To Go? gallery. Please contact Lifeofjay.com for any sales enquiries. Last week was a funny week. I've been a big fan of the Faber Castell PITT series of art pens for a long time so when Faber Castell contacted me with an invite over to Nuremberg as a guest to their International Drawing Awards and to visit the production processes and team behind the products I jumped at the chance. It was also a great chance to draw on some coffee cups and abandon them around Germany to run the gauntlet of claimed and taken home or trash bound. It was a creative fuelled adventure that the Faber Castell staff organised and made me feel like a PITT pen carrying pop star. One thing I did pick up from talking to all the staff, from the web manager, the PR team all the way to the guy who is responsible for the pigments and testing how much pressure to put on the pencil lead before it breaks (yep - they even do that) was a passion for the heritage, the company and the products they create. ...which made me realise, after some time spent together how important (and how hard it can be at times) to follow your passion. We all had different paths, struggles and goals but there were many parallels that ran through us all, truly inspiring people. 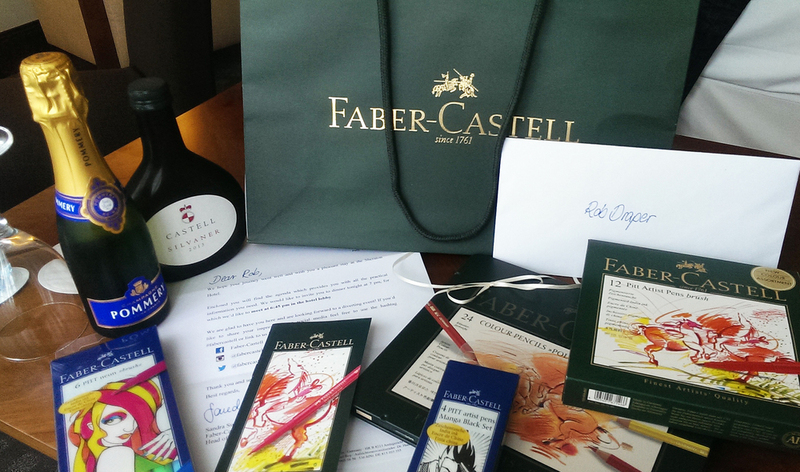 Big thanks to Carlotta, Sandra and Teresa and all at Faber Castell. More fun with the process and paper plates, everydays aim....Create. I get a lot of great emails, calls and requests for videos and to see my 'process'. The truth is, I don't have a strict process I work to, often the lettering i'm drawing and the surface I'm drawing it on end up dictating the process and time always plays a key factor too but I thought i'd create some 'stop motion' style videos of how some of the finished pieces come together to hopefully give you an idea.